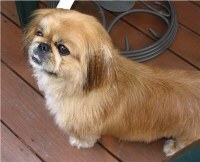 COCO WAS ADOPTED AUGUST 31, 2008! 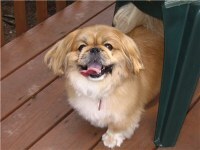 Coco is a very sweet and friendly 4 1/2 year old pekingese. She is spayed and up to date with shots. Records will be provided. Coco is housetrained and crate trained. She has recently been groomed. Her owner is moving and can no longer keep her. 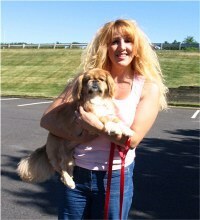 The intention was to attempt to place Coco before her owners moved to avoid her going to the shelter. They did not, however, respond to requests regarding Coco's availability when we received adoption applications and a few weeks later we found out they put her in the shelter. Fortunately, a prior applicant was still interested so Coco only had to spend two days in the shelter (where she refused to eat due to stress and depression), then spent the night in a foster home and went on to her new home. She is very happy now and her appetite has returned!